Does anyone remember when I wrote Think Before You Speak…well Cory Booker is learning how to do that. 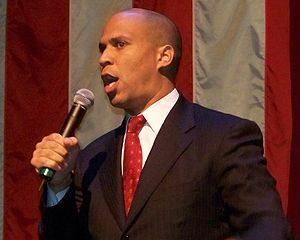 Newsmax reported that Mr. Booker, the “Super Mayor” of Newark, N.J., has been “sidelined” by President Obama’s campaign re-election team. His benching stems from his May, 20 interview on Meet the Press where he said he found the attacks on Romney’s record at Bain Capital “nauseating”. While Mayor Booker wasn’t wrong for his thoughts, going on a national television show and openly questioning “the coach” seemed like a rookie move to me when it happened. If he were playing in any championship game, had he questioned his coach on the sideline, everyone would have been up in arms and would have been happy to see him fined or benched for a game or two. So why would it be any different for the Commander in Chief who is fighting to keep his job? Cory is learning something my mother said a lot. “Don’t question me in public.” For her generation, it was considered to be rude and there is a level of respect that should be given to anyone whether they are your elder or your employer. You don’t have to agree with what they are saying but there is a time and a place to express your opinion and in front of the world, on a televised talk show, may not have been the ideal time and place to say what was on your mind. As for Cory, he has lamented that there are “lessons to be learned” and he is going to be more “careful” when choosing his words. This has to be a hard lesson for a rising star in the Democratic Party but at least he learned it early and I’m sure that he will find his way back into the good graces of the Democratic Party…but they are going to make him work!